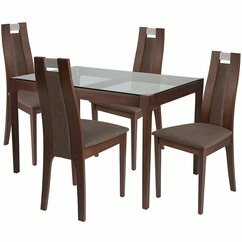 Choose ubuyfurniture.com for affordable, quality standard height glass top dining sets in the latest design styles. We offer glass top kitchen and dining table sets in nearly every shape and finish style. All Glass Top Dining Sets ship FREE to the continental U.S., usually within 3-4 business days!